When you cook meat (beef, lamb, pork, venison, etc.) sous-vide for a long time (8 hours or more) at a temperature below 60C/140F, sometimes the meat comes out with an unpleasant smell. Sometimes just faintly, sometimes very strongly. The bag may even be puffed up a little. I already looked into this problem several years ago, and wrote a post about it. But I did not really solve the problem back then. Luckily, now I seem to have solved it! It is mentioned in many sources online that this problem is caused by lactobacillus. This is a type of ‘good’ bacteria that are not harmful and they are actually used to make cheese, yogurt, sauerkraut, and sourdough bread. It is known that they can reproduce up to a temperature of 59C/138F, so it is not surprising that they are not killed when meat is cooked at temperatures between 55C/131F and 59C/138F. It is also not surprising that the smell is somewhat reminiscent of stinky cheese (as lactobacillus is what makes the cheese stinky, too). By the way, from a food safety perspective it is safe to eat the badly smelling meat, as lactobacillus is harmless (people even buy expensive types of yogurt to eat the lactobacillus on purpose). You may not just enjoy it as much. What is also mentioned in many sources is that lactobacillus can be killed, and the funky smell prevented, by searing the meat before vacuum sealing. This seems to make sense, because searing will kill any lactobacillus that are present on the surface of the meat. However, I tried this and it didn’t work. 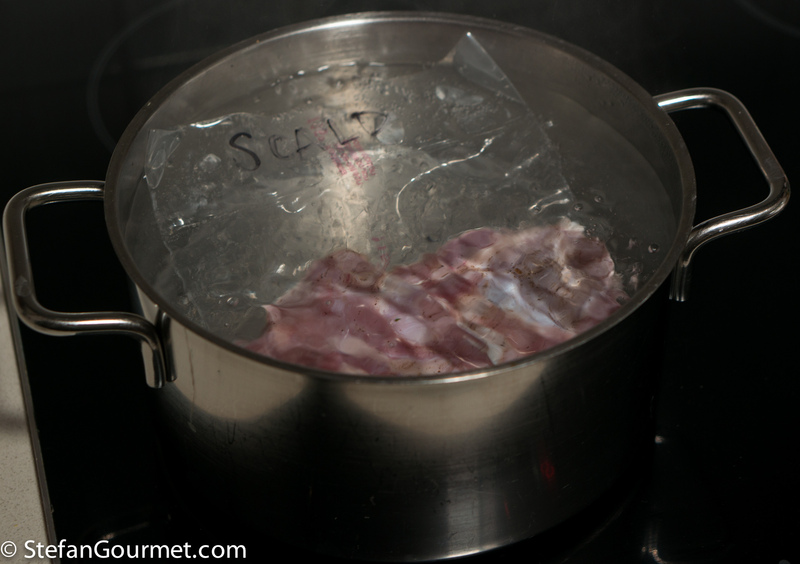 In fact, over the seven years I have been cooking sous-vide, I have had several occasions where pre-seared meat still ended up with the bad smell. So how is that possible? In the meantime, I have learned more about lactobacillus. The most important thing I’ve learned about lactobacillus is that it is (or at least can be) all around us. The process of making a sourdough starter illustrates this: you just mix flour and water, and ‘out of nowhere’ lactobacillus will start doing its magic. This why searing the meat and then vacuum sealing doesn’t always work, because after searing the meat can be infected again by lactobacillus before you vacuum seal it! Once I had realized this, I had a theory of what would work: vacuum seal the meat first, and then scald it in boiling water for about 30 seconds. The scalding will kill any lactobacillus that was on the meat when it was vacuum sealed, and because of the vacuum seal there is no way that new lactobacillus could get in again. I put this theory to the test, and it works! After repeating the results with another type of meat, I am now confident enough to present this solution to the world. 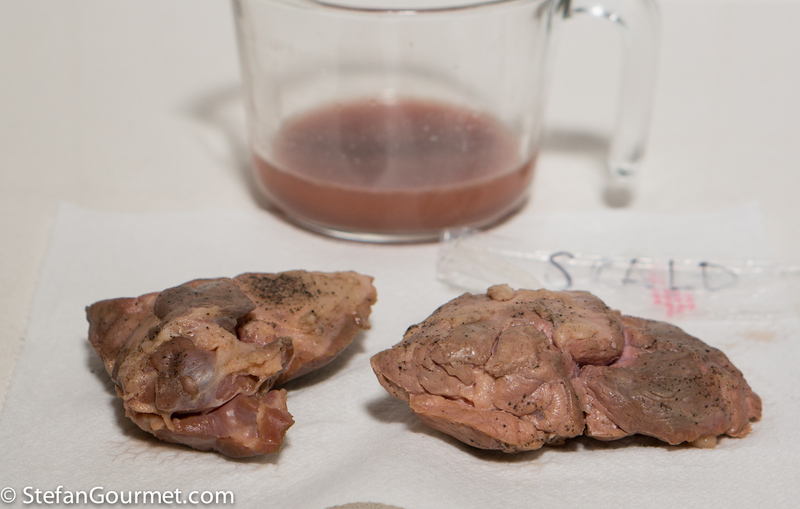 For the first experiment I started with a piece of lamb shoulder. I cut this into two pieces and seasoned with salt and pepper. Then I vacuum sealed both pieces separately. One of the bags I marked “SCALD” and I scalded it for 30 seconds in boiling water. This brief scalding will affect only the surface of the meat. 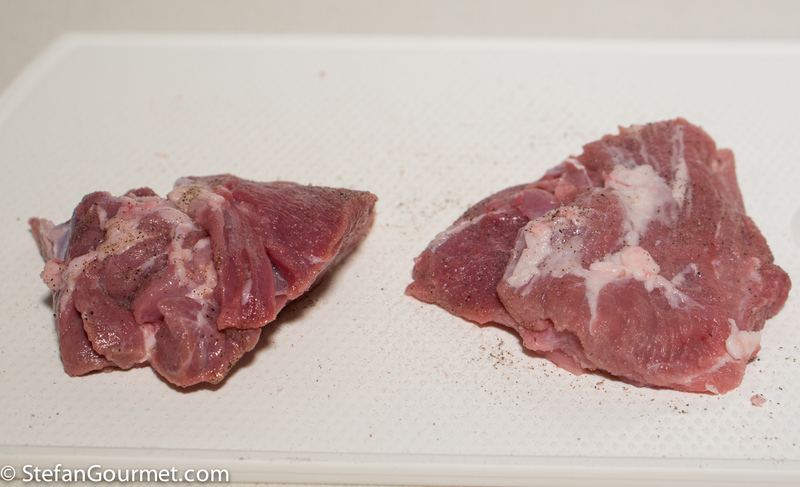 As you can see the two pieces of lamb shoulder now looked very different. …especially after taking them out of the bag. The scalded piece smelled of lamb, the un-scalded piece had a bad smell and was discarded. After this I proceeded as usual with the scalded piece of lamb and seared it in a frying pan over high heat. I repeated the experiment with a chuck steak, cooked 72 hours at 55C/131F. Again the scalded beef was perfect, whereas the un-scalded beef came out with a bad smell. So from now on, I will always scald in boiling water for 30 seconds after vacuum sealing when I’m cooking meat below 60C/140F for 8 hours or longer. (I have never had a problem with short cooks, probably because the time is too short for lactobacillus to grow significantly.) You can sear the meat before vacuum sealing it, and then you still need to scald it anyway. It is important that the surface of the meat is touching the bag everywhere so that the scalding can kill all lactobacillus. In other words, if vacuum sealing multiple pieces in one bag then make sure they are not touching each other. Excellent and very useful information. Thank you very much! 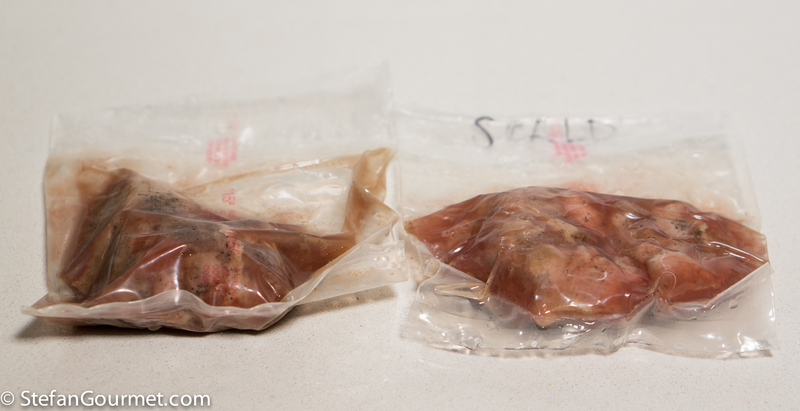 I have never had a problem with stinky meat in the sous vide, but I also have never cooked meat that long that low. However, this is VERY useful to know if I ever do! You’re missing out! Please try short ribs 48 hours at 135 degrees (and make sure to scald after vacuum sealing). I am assuming you like your steak medium rare. Yes, yes we do. 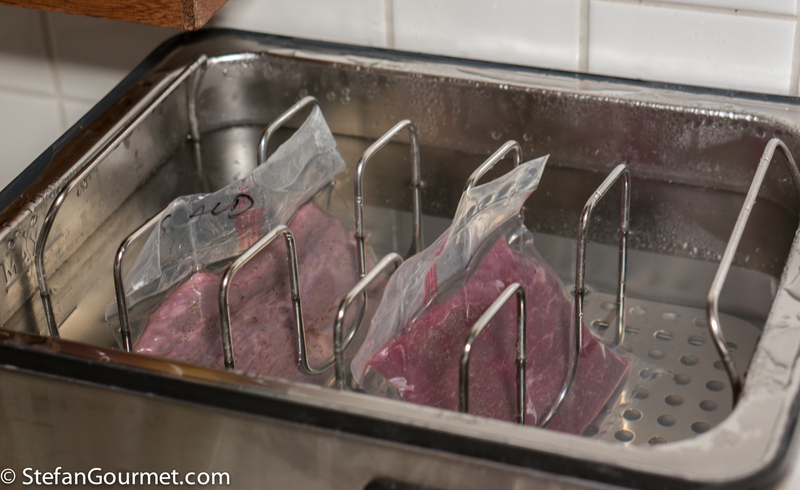 Now that my food cart is closed for the season my sous vide circulators are freed up for home use. I will certainly try this! *huge smile* Of course I know another way to avoid that possible smell . . . . sorry, Stefan: sometimes one’s resistance is low . . . 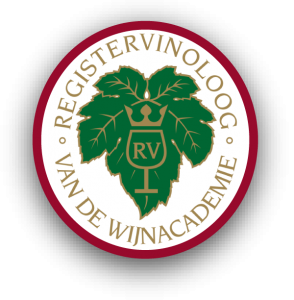 Thank you, Stefan, for sharing your results on your blog. Excellent experiment Stefan. That looks like a simple solution. I have enjoyed your blog tremendously. As my sous vide bags are only rated to about 180F, do you think an immersion in 170F water for a bit longer, say 2 minutes, would accomplish the same result? Hi David, yes that should work too. At 170F probably even 30 seconds should be enough as you just need the time for the heat to get through the plastic and then it will take only a second to pasteurize the outside. I mentioned boiling water because it is much easier than hearing up a water bath to an specific temperature. Outstanding information! I have wondered at times about negative long-process results others have had. I did a large [~11lbs/~5Kg] 3-bone beef rib roast for 16+ hours at 133F/56.1C then seared it under a broiler to brown. I had no bad smell so I suppose I was lucky. Will be doing pork ribs for 48-72 hours soon then hot smoking for a Texas BBQ experiment. I will scald them first. Thanks for the tip. Thank you for the information in you post. Excellent info it’s great that you shared. Though i must say in all my time doing long process sous vide I have never had that smell you talk about. (I can see it now having said what I said I maybe tempting providence😂) Maybe a discussion from people who have had the smell and where they live in the world, It maymight be the feed the the animal eat?? I have sous videed in UK and the Canary Islands. I’m pretty sure the contamination happens at the butcher’s or in your kitchen. Some people also notice the smell more than others. I have a friend who can’t eat anything that has the faintest whiff. I only rarely had the smell such that I didn’t want to eat it. But now I always blanch to avoid it altogether. What about a shot of whiskey in the bag? Supposedly alcohol doesn’t work well with sous-vide, but I haven’t tried that myself. When cooking at temperatures above the boiling point of alcohol (78C/173F) the bag will float, but that is not an issue of course when cooking below 60C/140F. ELL just from the surface of the meat? Hi Karen, the lactobacillus will grow during the cook if you do not scald the vacuum packed meat before the sous vide cooking. Scalding afterwards may slightly reduce the smell, but will not eliminate it. 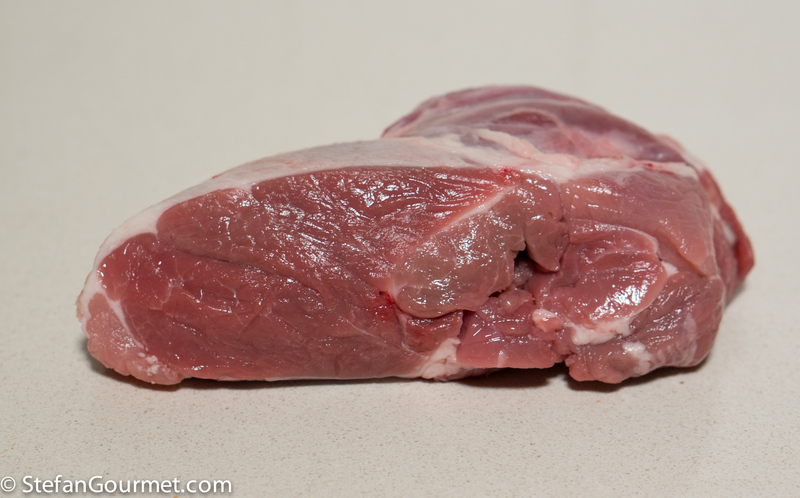 The smell is indeed just from the surface of the meat, but it can sometimes be so pungent that it is difficult to remove once it has been allowed to develop. Excellent suggestion. I was wondering if rubbing the meet with vinegar, as an ingrediente of a wet rub, will help control the funky smell since vinegar is supposed to help kill bacteria. Vinegar doesn’t kill all kinds of bacteria and lactobacillus actually make lactic acid themselves, so I doubt it. “meet” in my previous comment equals protein. One last question: would preheating the water bath above 145 degrees prior to submerging the protein and letting the protein sit at that temperature for an X number of minutes before lowering the temperature to the recommended “cooking temperature”; would this work? X would be at least 4 minutes at 145 degrees. I don’t know how much the transfer of heat is slowed down by the plastic. Afterwards I would recommend to lower the water temperature quickly using cold water. So yes that would work but just dumping in boiling water is easier I think. yeah i just cooked some ribs at 57C for 48 hours and opened the bag and threw up the smell was so rotten! should have read this first! Will you try again using this technique? Thank you for helping sous Vide land smell better. I’ve done it before and the smell was so bad I just couldn’t bare to eat it. Another issue is that even with tight vacuum sealing, cooking at 55°C also results in the bag bloating up and becoming a balloon. Any tips for this? The same solution should help for that as well. Unless you put other stuff in the bag that causes the bloating? 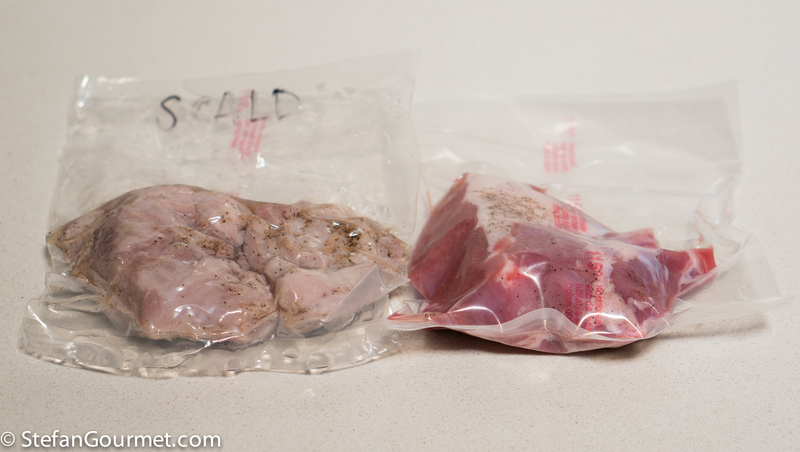 If you put meat, salt, pepper and scald the bag after vacuum sealing, there should be no bloating. Great, I have to test that. I have found that cooking pork ribs at 165 F, 18 to 24 hours renders tender ribs and great taste. I agree. At that temperature you don’t have the bad smell. An alternative, also very good, is to cook pork ribs at 135F for 24 hours. The texture will be very different (not ‘pulled’ or flaky), but for that temperature you do need to scald in boiling water to prevent a bad smell. Also, I have raise the water temperature about 150 F Stephan suggested 145–I just wanted to compensate for the drop in temperature once the protein is placed in the container. After 10 mins, I lower the temperature to the recommended temperature for the protein–also, adding ice to the water to lower the temperature faster is a good suggestion, but I have yet to find a need to do that. After all, what is 15 or 20 mins on on something that might be cooking for more than 10 hours. I found this blog because I was “researching” if I should expect to visit the ER in the next few hours. I sous vide pork ribs for 72 hours at 62C, the comments sounded worth the effort. The smell is pervasive throughout the house, ate one rib and threw the rest out. While I like meat to be tender, I also like it to have some texture. Thank you for the information about the bacilli, maybe I’ll watch some TV instead of heading for the hospital. I certainly will never again make 72 hour pork ribs and if I do any slow cooking it will be in addition to the 30 second boiling water trick. Thanks. I have never heard of or experienced this above 60C, but I assure you the boiling water trick will take care of it. Next time you do pork ribs, 48 hours at 57C will be a much better choice. The meat will be tender but more juicy and better bite than at 62C. I did a 6 lb chuck roast in triple bagged ziploc freezer bags and only got a very faint smell which I’m not even sure is the smell being discussed here. COuld it be that my generous salting on the surface killed or impeded the lactobacillus? Yes that is possible, but it would have to be very generous. Hola Stefan! Thanks for the article, I have had this happen to me twice in a row, the first time I started with steaks straight out of the freezer, vacuum sealed them and did a 4 hour Sous vide, resulting in tenderness but stinky. Tried it again with thawed steaks, same result. I am going to try your method, but was wondering if you think that if I scalded the frozen vacuum sealed steaks for 45 seconds or so would be sufficient to kill the bacteria. I originally thought (incorrectly) that the frozen steaks would have no bacteria issue but now I’m not sure. What are your thoughts? Thanks again. There are two reason why freezing does not help. First, freezing doesn’t kill bacteria, they only stop growing. Second, the lactobacillus are everywhere and so the steaks can be contaminated before you vacuum sealer them. I think scalding for 30 seconds would be plenty for the frozen steaks, as the lactobacillus are on the outside, not the inside. Thank you. I was wondering why my beef ribs were so stinky. I wonder if your solution would work on blade tenderized meat, such as the beef sold at Costco. Have you tried the technique on beef from Costco? I have never tried it with blade tenderized meat. If the blades are contaminated with lactobacillus, the solution would not work. With sous vide you don’t need blade tenderized meat anyway.